Allergen Information: Contains Wheat, Soy Bean. May contain milk, eggs, fish, crustacean, molluscs, nuts, peanuts, sulphites, mustard, sesame. Ingredients: Noodles: Wheat Flour, Palm Oil, Potato Starch, Thickening Agent (E1420 (Wheat Gluten)), Salt, Onion Concentrate, Sweetener (E420), Emulsifiers (E471, E322 (Soy), Acidity Regulators (E500, E501, E450, E451), Stabilisers (E412, E405), Green Tea Extract. Soup Base: Salt, Sugar, Flavour Enhancers (E621, E635, E363), Rice Powder, Meat Seasoning Powder (Beef Stock (Beef Bone Extract, Salt, Water)), Chicken Broth (Dextrin, Salt, Sugar, Chicken Flavour, Yeast Extract Powder, Garlic, Black Pepper, Flavour Enhancer (E635)), Black Pepper Powder, Acidity Regulator (E341), Soy Bean Oil. 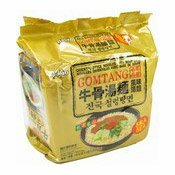 Simply enter your details below and we will send you an e-mail when “Instant Oriental Style Noodles Multipack (Gomtang) (韓國牛骨湯麵)” is back in stock!